(a) Remove the center exhaust pipe assembly. 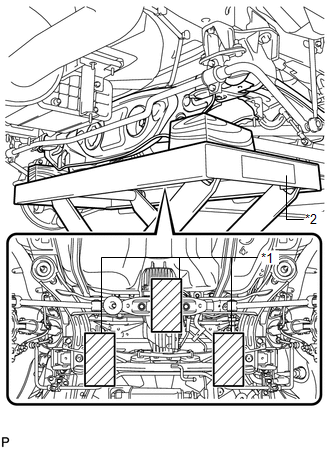 (a) Remove the bolt and separate the rear speed sensor LH from the rear axle carrier sub-assembly. 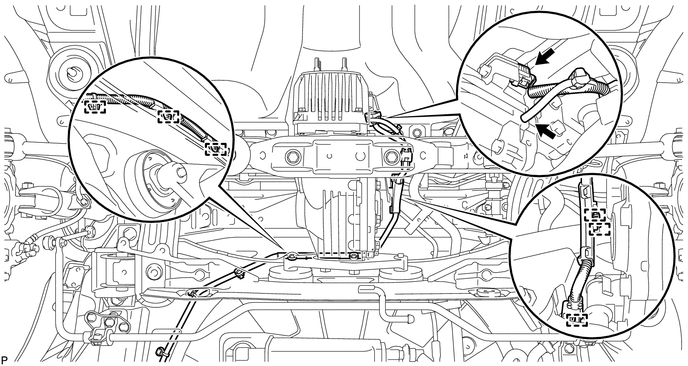 Keep the sensor tip and rear speed sensor installation hole free from foreign matter. 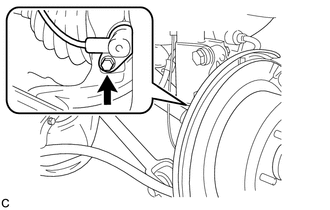 (b) Remove the bolt and separate the rear speed sensor LH from the rear shock absorber with coil spring. (b) Remove the 2 nuts and separate the No. 3 parking brake cable assembly. Perform the same procedure as the No. 3 parking brake cable assembly. (a) Disengage the clamp to separate the No. 3 floor wire from the rear suspension member. 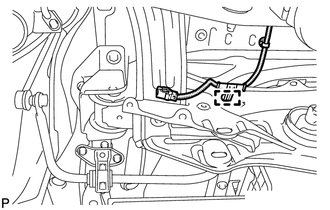 (a) Disconnect the connector, separate the hose, and then disengage the 6 clamps to separate the frame wire. 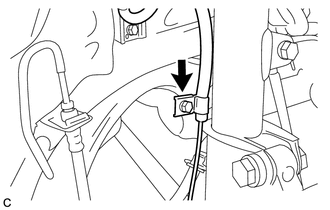 (a) Support the rear suspension member with a jack using 3 wooden blocks as shown in the illustration. Use properly sized wooden blocks to keep the jack and suspension member level. 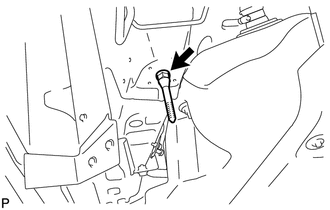 (b) Remove the 4 nuts, 2 bolts and 2 rear lower suspension member stopper retainers. 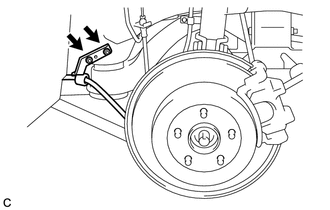 When lowering the rear suspension member, be careful not to damage the vehicle body or other components installed on the vehicle. 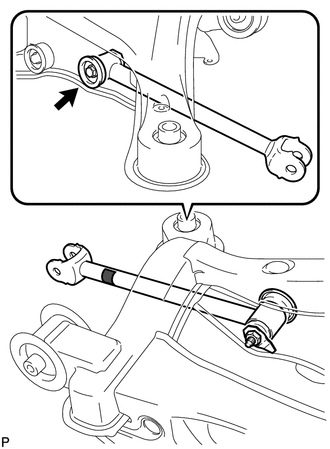 (d) Remove the 2 rear upper suspension member stoppers. (a) Remove the bolt, nut and rear No. 1 suspension arm assembly LH from the rear suspension member. 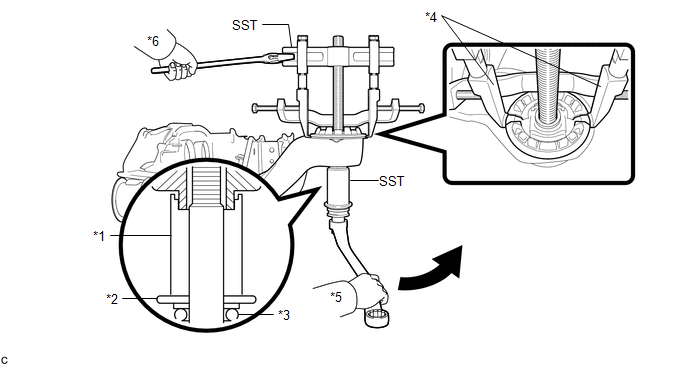 (a) Using SST, remove the rear suspension member body mounting front cushion. Set the tips of the claws in the cutouts of the body mounting cushion. Securely install the spacer No. 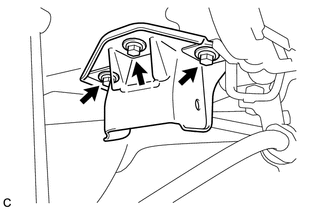 1 to the inner cylinder of the body mounting cushion as shown in the illustration. 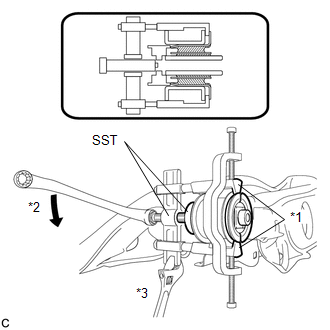 Apply a small amount of grease to the threads of SST (center bolt) before use. Tighten SST slowly and evenly. Be careful as the body mounting cushion may fly out. The body mounting cushion cannot be reused. 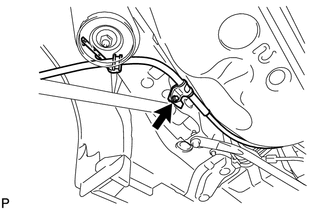 (a) Using SST, temporarily remove the rear suspension member body mounting rear cushion. 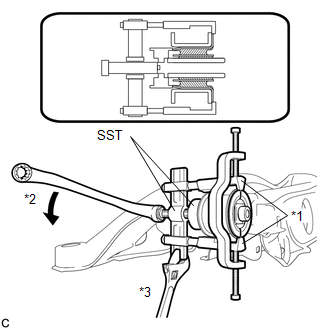 (b) When the mounting cushion protrudes approximately 6 mm, reassemble SST as shown in the illustration and remove the mounting cushion. Use the shorter center bolt first, and then change it to the longer center bolt. (a) Remove the 6 hole plugs. (a) Remove the 3 bolts and rear No. 2 body mounting bracket sub-assembly LH. (a) Remove the stud bolt.